This Saturday, I'm offering a gelatin monotypes workshop at the Howard County Center for the Arts, in Ellicott City, MD. I've taught this technique at the National Museum of Women in the Arts, the Creative Alliance, School 33, and the Greenbelt Community Center, and it is always a lot of fun! This will be my first time offering it at my new location. Saturday, May 4, 3 - 6 p.m., $60, materials included. Please register here by Thurs. May 2. Create one-of-a-kind, painterly prints using gelatin as a printing surface. Ink transfers beautifully from the smooth gelatin surface, with very little pressure. The material is very versatile, and while it can mimic traditional printing processes, it possesses its own unique qualities and the process lends itself to experimentation. Participants will be instructed in a variety of techniques, and then create a set of experimental prints. An inked gelatin plate, with stencils placed on top. Gelatin monotype printing is a low-tech, non-toxic form of printmaking that requires no press and used water-based inks or paint (we will be using akua kolor inks). The printing plate is made from a simple gelatin recipe. Ink can be painted directly onto the plate with brushes and then printed onto paper. The ink transfers easily with very little pressure. Of course, there will be a little ink left on the plate, which is perfect for creating "ghost prints." Press nature specimens or textured items into the ink to capture and print the incredible detail. Feel free to bring plant trimmings or other textures you'd like to try printing! You can also cut your own stencils for blocking out on the gelatin. or printed in layers, for more emphasis on texture, color layering, and transparency, or even to create a pattern. You can even cut and carve your gelatin for a relief technique, using clay tools cookie cutters. Create patterns, line work, or cut "puzzle pieces" that can be inked separately and put back together for printing. I always save this step for last since it permanently changes the plate! Try these techniques and more at my workshop on Saturday! You will walk away with a stack of experimental prints and a recipe to make your own gelatin plate for printing. All experience levels welcome! I was asked to create artwork for an Art in Hand deck of cards. Art in Hand decks are unique playing cards designed by local artists--each card in the deck is designed by a different artist. The deck I'm participating in is a USA deck, with an animal theme, and each card is assigned to an artist from a different state. For Maryland, I'm working on the Queen of Hearts! I chose to depict two alpacas (or llamas? I don't know the difference!). 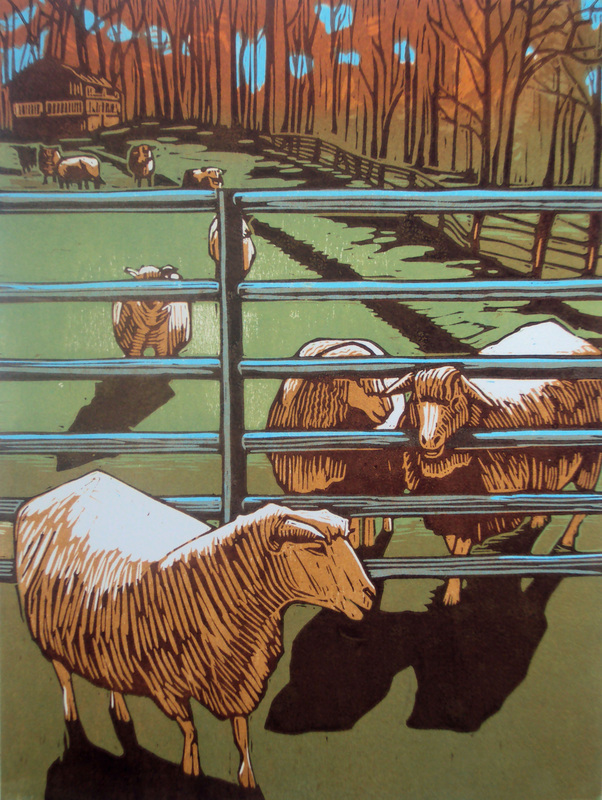 I photographed them at Shiloh Farm, during the same visit when I photographed sheep for this print a couple of years ago. I've been holding onto the photographs, hoping these guys would make it to a woodblock some day. Key block on the left, yupo on the right. So I made the sketch and carved the keyblock, then inked the block and printed it on yupo. Yupo is synthetic watercolor "paper" that is non-absorbent, so the Akua ink is not permanent on that surface. I basically use it like mylar, to transfer ink from my key block to the color blocks. Yupo on the left, color block on the right. Here, I have printed from the yupo to the next uncarved blocks, and they are ready to carve once I make some decisions about the color. I also proofed the key block on Rives BFK. My next step is to hand-color the black and white proof, to make decisions about the color and then use as a reference when I carve the color blocks. The finished artwork is due May 1, which is a full month later than the original deadline, but still somehow managed to sneak up on me. It will happen. It totally will. Fortunately, I just need one good print to submit for the deck, and then I can print the full edition at a more relaxed pace. Until then...hurry up and print! Last Call for Block Printing on Fabric! Please let me know ASAP if you are interested in attending the fabric printing workshop this Saturday. Saturday, April 27, 3 - 6 p.m., $60, materials included. Carve your own unique design into soft rubber, then use fabric inks to print the design on a jersey-knit scarf. * Participants walk away with a hand-carved stamp, for continued use on fabric or paper, and two block-printed scarves that are ready to wear after a quick iron. *Feel free to bring additional fabrics to print on as well! I'm offering a Block Printing on Fabric workshop this Saturday at the Howard County Center for the Arts, in Ellicott City. Saturday, April 27, 3 - 6 p.m., $60, materials included. Register here. Carve your own unique design into soft rubber, then use fabric inks to print the design on a jersey-knit scarf. Participants walk away with a hand-carved stamp, for continued use on fabric or paper, and two block-printed scarves that are ready to wear after a quick iron. Below are some photos I took while preparing for the workshop. Learn to transfer a design to the block. Carve away lines, negative spaces, and unwanted material to create the stamp. Then, print on a jersey-knit scarf. Here are just a few of the beautiful colors available for the scarves. I love seeing them all together--so pretty! You're also welcome to bring your own fabrics to print on, such as tea towels, cloth napkins, clothing, quilt blocks or other materials to sew. The possibilities are endless! All materials are included, but it's a good idea to bring a photo or sketch to use as inspiration. The registration link is on my workshops page. Hope you'll join me! Below are some photos from my Woodblock Printing workshop at Traillworks, in Newton, NJ. It was fun, and I was really impressed with the prints that were created! I'm looking forward to teaching three more workshops at the Howard County Center for the Arts this spring: Block Printing on Fabric April 27, Printing without a Press: Gelatin Monotypes May 4, and Woodblock Printing on June 8. Please check out my workshops page or flyer for details. All experience levels are welcome! As a new Resident Artist at the Howard County Center for the Arts, I'm pleased to offer some new printmaking workshops this spring! Workshops will be held in Classroom 8 at the Howard County Center for the Arts 8510 High Ridge Road, Ellicott City, MD 21043. Carve your own unique design into soft rubber, then use fabric inks to print the design on a jersey-knit scarf. Participants walk away with a hand-carved stamp, for continued use on fabric or paper, and two block-printed scarves. Saturday, May 4, 3 - 6 p.m., $60, materials included. Create one-of-a-kind, painterly prints using gelatin as a printing surface. Ink transfers beautifully from the smooth gelatin surface, with very little pressure. The material is very versatile, and while it can mimic traditional printing processes, it possesses its own unique qualities and the process lends itself to experimentation. Participants will be instructed in a variety of techniques, and then create a set of experimental prints. Saturday, June 8, 10 a.m. - 4 p.m., $100, materials included. Learn the process of creating woodblock prints, or "woodcuts". Participants will create a line drawing on wood, then carve away the negative space to produce a bold, linear "key block". We will then transfer the design to a second block to carve and add color. Printing techniques will be introduced, as well as instruction on using non-toxic Akua inks. The woodblocks can then be used to print an edition or experiment with color variations. Materials will be provided for all workshops, but it is a good idea to bring a sketch or photo to use for reference and inspiration. Please see my Workshops Page for more details and to register. I hope you'll join me for some printmaking!